Some folks have started to take exception to companies that rely on people’s nostalgia to peddle their tech. But that ain’t stopping Nokia. Last year at MWC, Nokia (which isn’t really Nokia anymore, but HMD Global) revived it’s iconic brick phone, the 3310. 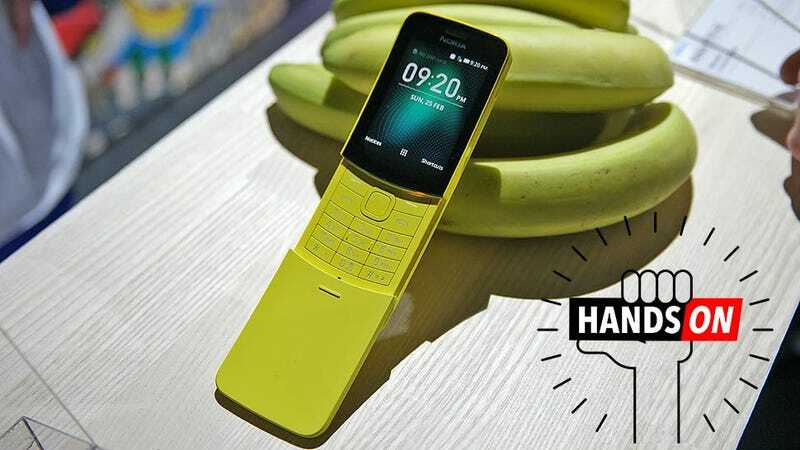 But for 2018, Nokia is going one step further by bringing back its legendary banana phone, the Nokia 8110. For those who don’t remember, the 8110 was the original slider phone. Back in 1996, the high-end 8810 was the first Nokia phone to feature a monochrome graphic display, in addition to its signature slide out mic that could be opened to access the T9 keys inside, or closed to end calls. It was even featured in The Matrix, remember how hot that was? It had people dressing up like cybergoths for years after. While you still can’t quite call it a smartphone, HMD Global has given the Nokia 8110 a number of improvements to help it function better in 2018. The first of which is full 4G support so you can use it on modern cell networks. On top of that, the screen is color now, rather than black and white, and by using HMD’s Smart Feature OS, the phone can handle a limited selection of apps including Facebook, Mail for Exchange, and of course, Snake. HMD is even planning to run its own app store. But perhaps the sweetest thing about the new 8110 4G is that in addition to being available in classic black, there will be yellow model too. Bananas. There’s no official word yet if the 8110 4G will make it to the US, but with a price of just 79 euros, it shouldn’t be too expensive if it does. The 8810 4G is due out in May.